A long time ago in a blog post not that far away, the roleplaying community of Intaki Prosperity Initiative found itself beset by another war declaration (wardec) aimed at their hi-sec Customs Offices. 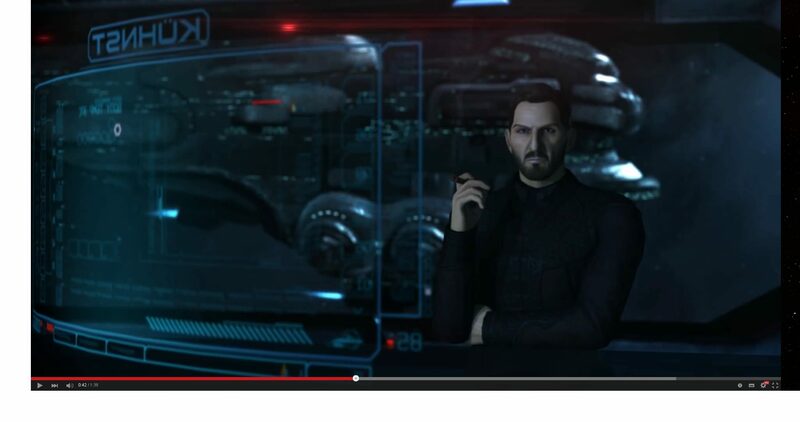 Sakaane Eionell – the CEO – was not concerned about the notifications of war, or the loss of the 14 POCO’s. They are exclusively a role playing corp whose only interest in the wardec system is the pursuit of their own RP scenarios. This has always been very difficult for them, as their role-play involves a level of player engagement that is not just about blasting each other’s pixels. Sakaane digs deeper and suggests a different approach to how wars should be built up, based upon a growing number of engagements between involved parties. I encourage you to read Sakaanes post before I go full in with this as inspiration, it might help a little but is not required for the following to make sense. The way we use the word wardec in EVE seems to have lost its meaning and effect. Real-world wars are catastrophic. Entire regions can be affected by refugee crises, lack of provisions and loss of vital infrastructure. It can take years for a region to recover from war. Even more so if the refugees are afraid to return, or comfortable and well established in their new country of asylum. The soldiers themselves are also affected, suffering from post-traumatic stress disorders, often for many years after the war has ended. The great wars in EVE share some aspects of real-world warfare on the virtual level. Entire sweeps of the map are altered and change allegiance when empires clash, causing migrating players to seek asylum elsewhere if they lose the war. These wars don’t happen overnight or get concluded in the first fleet engagement. They can take months of planning and logistics, leading to a climax resulting in epic battlefields littered with wrecks. Sometimes they can be defused through “diplomatic” channels to great effect and benefit to the players from both sides. The major conflicts of the null blocs are therefore rightfully called wars. None of this requires a wardec, however. I wonder: is it the lack of a motivational objective and impact in a wardec that makes them seem inferior. I got inspired by Sakaane’s thoughts and background as a role player in EVE, some of the other ideas submitted into the #wardecProject on twitter, and from reading the recent Pod and Planet fiction writing contest results. As a result I have formulated the fictional system of a Lore War: a series of smaller conflicts scaling up to an open wardec in high sec. A universe as rich as New Eden already has faction warfare, supported by much lore and background for each of the empires. Although not a lore expert by any measure, I do enjoy a good narrative supporting a war in EVE. The current wardec system is not narrative driven, and is simply a few clicks away. In 24hrs total open war is upon you, and all your assets in space are now at risk. Every single corp member, ship hull, POCO and POS is now an exposed target where it was once safe. That escalated quickly! What if a wardec required an escalating narrative coming from both parties instead? Declaring war on a corp/alliance would be replaced with “engagement licenses” that each have specific goals and targets. Completing several of these licenses would allow you to declare open war on your opponent’s entire collection of assets. The size of the objective in this license increases with the size of the target, and that requires strategic decision-making. A basic POCO engagement license against a small corp (<30 members) may only require one POCO. That first POCO will be the only asset you may shoot until the license has expired or is completed. With a much larger target, a basic POCO license may require 5 POCO’s before counting as complete. Players in the target corp/alliance would still remain neutral to your side under such an engagement license. However, you will become flagged as suspect to them. If they choose to do so, they can freely shoot you according to suspect flag mechanics. Of course this will create a limited engagement timer that allows you to shoot back. Helpless defenders no more, there is now a lot more a defender can do when under threat of war with an engagement license system. Since no intel is given with an engagement license, only the objective, it puts more power in the defender’s hands and can help to create a narrative for their corp/alliance. An asset license may be issued that covers 3 POCO’s and you have options. The defender can choose to accept the license and transfer 3 POCO’s. This would grant them a four week reprieve from another engagement license from that same group. For the purposes of lore, let’s say that when such a license has been accepted peacefully, CONCORD would be more reluctant to issue another in short order. The threat of war from this opponent has been averted for the time being. If the defenders have no POCO’s, or not enough for the attackers to fulfill the license objectives, they need not worry. The engagement license will fail for the attackers and the defender’s pilots will remain safe in space doing what they do, while the attackers desperately hunt for your nonexistent POCO’s. A defender may still hunt failed attackers, knowing that they are safe until they aggress first. The attackers will have wasted this engagement license. This can be ample time for your pilots to hone their own PvP skills against their own personal “pirate” suspects if they choose. This is aimed at offering more options for consensual PvP engagements. Under this system system the practice of holding corps being the ones who hold assets has the potential to change. You can now lose POCO’s without a wardec, allies, or any combat. During the first week of a POCO license, the attacker would be allowed to “mark” assets for engagement objectives in week 2. This will present an escalation of content, allowing the attackers to specify the exact POCO’s required to complete their new engagement license. This creates a loop back to the defenders who can choose to accept the transfer of the named POCO’s and secure a four week immunity from this group, or know exactly where they need to be prepared to defend. In the same vein as a POCO license, this license allows you to engage only a POS and its anchored modules. The defender’s ships would remain neutral to the attacker, but they would retain their own engagement flag with you as above. However should a defender choose to actively operate the POS defences, this player will also activate engagement flags on themselves for the duration of the POS engagement license. The objective for completing the POS license would be based on the size of the target corp/alliance and weighted by the size of POS the attacker first engages. Let’s call this POS points. A small would be worth 1 point, a medium 2 points and a large 3 points. If defenders choose to unanchor and remove a POS that you have already activated, it counts towards your objectives as attacker. Against a small corp of less than 20 members, a POS engagement license would require 2 POS points. This would enable you to engage your targets in a variety of ways. You could hit a large or medium POS, but this would be the only POS you can engage for the remainder of this license. If you split the license objectives up, you can engage 2 small POSes under this engagement. Issuing a POS engagement license against a larger corp/alliance would still cost the same amount of ISK, but the POS points required would scale up to a maximum of 9 POS points. That is either 3 Large POS destroyed/removed or any combination you can achieve from multiple POS hits. These figures are hypothetical and open to interpretation. PvP ship combat is a major part of EVE, and so this license is likely to be one of the most popular. It is the only one that provides a guaranteed target, unlike a POCO or POS license which can fail purely due to the lack of the defending corp owning any or enough of those assets. The ship engagement license will have a sliding scale for a total ISK damage target or number of kills set by the attacker. This would need to have a base threshold of total damage or ship kills to avoid abuse. A minimum target would start around 500mil ISK total, or 50 killmails, which the attackers can scale upwards when issuing the engagement license. Like the current war mechanics, a report would be generated for both parties to see. The losses on both sides will count towards this total, so for each ship the defenders kill, the more the attackers will have to kill. During a one week period, attackers can engage ships until they reach the value set as their objective. So if they set the very minimum target value and reach it in less than 24 hours, they have to wait the rest of the week before being able to issue another engagement license. During that time they can not further engage their targets. The defenders can fight back to counter the objectives set in the license at any stage in the seven day period. They would be sent a notification if attackers reach their engagement goal, and then get 24 hours to alter the results. 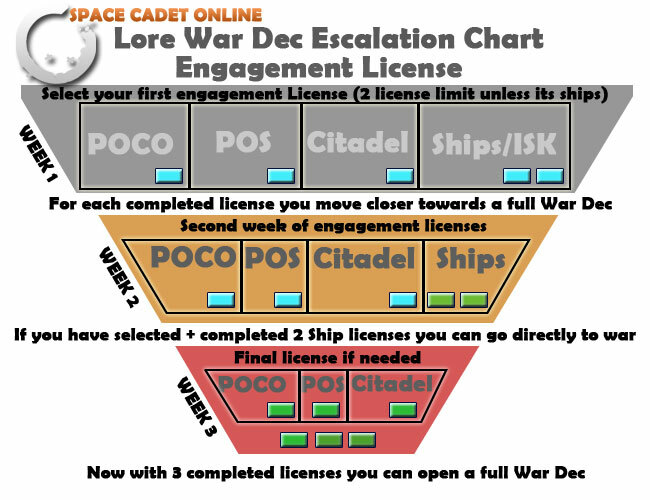 This way, the ship engagement license can become a skirmish tool as both sides compete for the objective value set. An attacker can still fail this engagement if they suffer too many ship losses before the license expires. To maintain a risk vs. reward balance, attackers will have to put aside 30% of their ISK target as a collateral for this license. At these figures It would make a basic ship engagement license cost attackers 200 mil ISK upfront, with 150 mil ISK set as the collateral which will be returned if successful. If no ships have been engaged, all of the attacker’s ISK is returned to them. If the defenders are successful, then they receive the collateral ISK and deny the attacker earning engagement points against them. However, if the attackers manage to destroy the set amount in ISK/hulls by the end of the week they will have achieved two points of engagement and only require one more before they can open a full wardec. Using the license system it would now take a minimum of two weeks worth of engagements before a wardec can be issued that covers all assets. The attackers require three points of successful engagements and may only select 2 asset licenses or one ship license per week against a target. The defenders can intervene at various stages in the process and hinder the progress of an impending full wardec. Even if we retain most of the current features of wardecs, such as costs, allies, mutual war and surrender offers, the defenders are still in a strong position if they choose to fight back. Such a radical change is going to be controversial and will naturally have many doubters and detractors. Since this is a theory piece, it is hard to provide evidence, and I can only speculate on how this system would affect wardecs in the future. I may well miss some obvious points, if so please feel free to comment. Would this create a barrier to “content”? Personally I don’t think that it would be worse than the way wardecs work now in this respect. Currently, you have no guarantee that your opponents will even fight if you wardec them. In fact it is a very popular response to deny content. If anything, my system offers more potential for PvP engagements. Defenders will have the option to counter engagement licenses, either through combat or diplomatic options, and stop a wardec before it begins. As a defender, you will know exactly how many assets the attackers need to destroy and could defend these assets to stall the process of getting involved in a full wardec. This can help to create a narrative as well as content for players on both sides. This system has the potential to reinforce the importance of cohesion within corps and would help to reduce the current response of dropping back into an NPC corp. I consider that an encouraging thought. The many routes defenders can take to counter each engagement license would be different each time. How much would killing one pimped out attacker’s ship affect the scales in a ship engagement license? Should defenders find themselves under a ship engagement license, their deployed assets in space would still be safe and Citadels could be used as staging areas to fight back. Attackers can manage their content in variable ways. For example, they could only turn up in frigates and destroyers, looking for good fights. Mercs could have more control too and not even require a full wardec to fulfill their contracts. The engagement licenses would allow them to customise contracts to their own specialist area of operations, whether it is structure removal, or good old pew pew. Neutral alts would also become less of a problem under certain engagement licenses. The defender’s ships would be safe from attack under an asset license, although all attackers would be freely engageable and flagged as suspects for them. In high sec this means any neutral assistance leads to global criminal flagging and is dealt with accordingly. The attacker is the only one allowed to shoot the POCO, if he gets assistance from a neutral, that third party gets a criminal flag, and anyone can engage them freely. This includes the defender’s ships who still can not be shot by the aggressor, until they activate their own temporary engagement flags. The main obstacle with this system is small or one man corps. An entire issue that we all have views and opinions on including most of the WDP contributors, seen even now as a problem with the current wardec system. There are ideas and names such as, “corp-lite” and “social-groups” being more popular in discussion. Should these small groups be allowed to anchor assets in space? Could they be a stepping stone between NPC and full benefits of a player owned corp? The end result is that wardecs take longer to enact upon a target and you must have made a concentrated effort in order to get to this stage of open warfare. Defenders have the option to prevent themselves from falling under a full wardec at several stages through the process. Attackers will technically need to be engaged for a minimum of 2 weeks before being able to declare an open war. This system of Lore Wars/engagement licenses provides more narrative and purpose, with objectives being used as the only means to enter into a wardec. Once engaged in a full wardec all mechanics are as they currently are, with everything you own now at risk.